I gauge the turning of the seasons by which drinks I desire, and my strong yearning for daiquiris and mint juleps is as accurate as any calendar for telling me it’s summer. Normally, I’d be stocking limes, mint, and soda. But my summer drinking plans have been disrupted by the fact that I am moving cross-country to San Francisco, so I need to use up all the leftover specialized booze that I bought, made a drink or two with, then stuck back into my liquor cabinet: things like Bénédictine and Crème Yvette that I don’t want to lug to the West Coast. You probably don’t have quite the same dilemma, but everyone has bottles of random booze sitting around. So, I wondered, is there a single technique that I can apply to any booze to make a great summer drink? Little did I know frat parties would end up inspiring the solution. To be clear: I’m not after the ultimate summer cocktail. We already have that and it’s called the daiquiri. I am looking for a single technique that can be called upon at a moment’s notice no matter what is on hand, and deployed to large groups of friends in the waning sunlight after a day spent outside. • Some kind of citrus-sugar combo. • Seasonal fruits and herbs (specifically: mint). • A lot of ice. So I lined up bottles of Pernod, Calvados, Bénédictine, Crème Yvette, Chartreuse (both green and yellow), Fernet Branca, and sloe gin. When my wife saw the bottles, and I told her about this project, she said, “That just sounds bleak. No one is forcing you to finish all these, you know.” Not only had that thought not occurred to me, it actually offended me. Anyway, I tried various combos of the booze and what I discovered after way, way too much trial and error — my wife actually tried to wipe her teeth off after sipping my Yellow Chartreuse and Tonic — is that none of the above SDSTs can reliably turn any liquor into a summer drink. Citrus and mint fight with too many other flavors, seltzer on its own tends to water things down, and in desperation I even dosed a drink with vinegar (I’ve seen bartenders do it!). The results made my wife forever less trusting of me. So this was turning into a fool’s errand that would end with me, divorced, drowning my sorrow in leftover Frangelico. But if college kids can make things taste good by dumping handles of terrible booze in a trashcan and spiking the whole thing with Hawaiian Punch, I should be able to figure out a way to make something summery with Fernet Branca. From that dark thought came the answer: Punch. Punches are often an inelegant solution and I never want to call upon a technique used by frat guys if I can help it. Luckily, punch has seen a recent restoration at the hands of cocktail historians and nerdy bartenders and we can now create something refreshing, fruity, and excellent for groups without having to resort to spiking ginger ale with vodka. Punches were the progenitors of our current mixed drink and are similar to the Prohibition-era cocktails we all love. More important: They were at least partially invented to help turn foul-tasting booze into something palatable. The secret to creating a smooth and elegant punch is to prepare something called an oleo-saccharum. It’s easy to make: Just steep citrus peel in sugar for a little while and let science do its thing. The sugar pulls out the oils in the rind, and you’re left with an infused citrus-sugar base that gently sweetens and brightens almost anything. The consistency is halfway between a syrup and wet sugar, but it dissolves almost instantly into drinks. Now I was onto something. But oleo-saccharum sounds like something a dentist from 1850 would give a patient before yanking out a tooth; I’ve just kind of taken to calling my batch summer syrup. The other problem is that you need to let the citrus steep in the sugar for at least 30 minutes. It will be that rare day when you have fifteen lemons and 30 minutes to spare, but are also somehow only able to procure subpar or obscure booze for your drink. So my advice is to pretend you are preparing for a nuclear winter or Y2K or something and make a jug of summer syrup that you can leave in the fridge. You can eyeball the amounts when you make it, but I’d say peel about ten lemons and three big oranges for every two cups of sugar you have. (Use a vegetable peeler — and don’t peel any of the white pith off the fruit.) Mash it all together in a bowl and let it sit. When it’s ready, ditch the peels and save the oily sugar. I mixed some ice, an ounce of summer syrup, and an ounce each of Pernod and Crème Yvette. I shook it furiously, then strained it into an ice-filled glass and, to make it more refreshing and summery, topped it with a little seltzer. It worked: citrusy, light, refreshing, but with character. I tried it with Fernet and Yellow Chartreuse. Again: totally drinkable. These are liqueurs that should not go together, but with the coercion of my sweet citrus-oil friend, everybody gets along. Even my wife agreed. 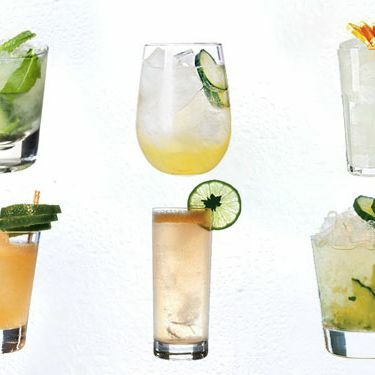 For each drink, combine 1 ounce summer syrup, 2 ounces liquor (literally, any kind of liquor), and ice in a cocktail shaker. Shake until cold then strain into a glass filled with fresh ice. Top with seltzer and garnish with some mint or cucumber.